From the moment my GT Academy journey was over at the hands of eventual champion Matt Simmons, I decided to dedicate myself fully to the sim racing world as being a 30 year old with a wife and daughter, real racing was not going to be that feasible. So how could I give myself the most realistic racing experience possible, whilst still being able to use my computer for other needs too? I did a lot of research but I kept coming back to the GT Ultimate from Next Level Racing. Also, being an Australian company that only made it all the more appealing. I spoke to the team at Pagnian Imports about delivering one to Melbourne and before I knew it the courier had arrived. After an hour or two of setting it up just the way I liked, I sat down in the simulator just to get a feel for it, and there’s a LOT about the GT Ultimate that gives me that lifelike experience. It only was aided further when I fired up my Fanatec wheel and my Buttkicker primed that the level of immersion I’d just gotten was incredible. I’m only using a single screen setup for racing at the moment, but the next step is triple screens and before I know it I’ll feel like I’m at Silverstone all over again! The biggest surprise to me was that I am so comfortable in the rig itself that I can quite comfortable play First Person Shooter games as well with the added Keyboard and Mouse tray. All that I do is slide the seat back, move the tray forward and I’m in Battlefield before I know it. It’s been a dream experience for me and ticks every box that I had for it – incredible value! Since I was a teenager, I had always wanted a driving rig, and more than 15 years later I have it. The GT Ultimate v2 simulator from Next Level Racing is a driving sim ready for almost any steering wheel and pedals you can throw at it. With so many driving games around right now, it seemed the perfect time to move on from the controller and sit behind the wheel. Recently this month we got F1 2015, before that was the long anticipated Project CARS and soon we’ll get Forza Motorsport 6. It’s a great time to be a racing fan. After spending some time with the GT Ultimate v2, its time to give you a run down of what works and what doesn’t. Keep in mind this review may be updated over time as more titles come out as well as how it suits additional steering wheels and pedals. Because of it’s size and weight, receiving this online purchase is something that needs to be planned. Getting a delivery ticket and picking it up from the post office or depot isn’t going to work for this, especially not with a sedan. Fortunately I was home when it was delivered and shortly later I was slicing through tape and cardboard faster than a knife through butter. Shortly after opening the box I knew it wasn’t going to be a quick job to setup. There’s multiple components, plenty of bolts, screws, washers and 3 sets of instructions if you choose to follow them. Bolting everything together really starts with the seat, everything bolts on to that and you progressively build forward. Stopping only to take some happy snaps along the way, the assembly took around an hour to setup and probably the first few races to really get things squared away in terms of angles and positions. If you’ve ever tackled Ikea furniture, or any flatpack for that matter, this will be a breeze by comparison and is certainly able to be completed by one person. The first thing I unboxed was the seat and with a hard glossy black finish that transitioned to a cushion fabric front, it has all the right looks. When it comes to the rest of the hardware, Next Level Racing weren’t mucking around when they built this thing, the steel is bloody huge. I’m pretty sure you could actually have a crash in this thing and survive. The bolt together design kept getting stronger the more pieces of the rig that came together. You don’t have to, but I chose to bolt the front wheel and pedal mount to the rig. This section features a massive checkerplate section, you know the kind you’d find in the back of a tradies ute, built for serious work. The strength and build quality of this rig is high and needs to be, as there’ll likely be a line of your mates cued up to try it. Thanks to more than general seat size, even your heftiest mates will be able to enjoy the racing action. In terms of the vertically challenged, height doesn’t seem to be an issue either, with the seat capable of moving back and the pedals forward to allow drivers of all sizes. At 6 foot 3 inches (193cm), I’m on the taller end and I feel there’s plenty of room to extend if my 6”5’ brother wants a turn. A real strength of the GT Ultimate V2 is the completely configurable front section. When you’re racing for long periods of time, it’s like highway driving, you want to be comfortable. You don’t want to feel like you’re reaching for the wheel or stretching for the pedals, the right distances everywhere are critical. Some simulators are dedicated to one driving position, making them great for F1, but unrealistic for the driving position of a rally car. By just adjusting the seat recline and pedal angle, in seconds I can transition between race types, big ticks here. One area I did miss adjustment was the angle of the seat base, however given the base of the seat mounts to the brackets that run to the floor, this would be hard to achieve, it’s very different to an office chair, but does exist in your passenger car. There’s bolt holes in the wheel mount and the pedal mount that fits a seriously long list of steering wheel and pedals. The one I have is the Thrustmaster Ferrari 458 Spider. The pedals bolt, but the wheel doesn’t sadly. The consequence of this is the clamp style mount means there’s a decent amount of vertical play when using the wheel. If you don’t pay attention, you may end up hanging off the wheel a little. This more of an issue with the wheel, rather than the rig. It works and works well, just could feel more stable. Unless you’ve got an ultimate man cave, you’ll need to find a place in the house to fit this rig. All setup you’ll need around 155cm in length and around 26cm wide, that’s not including the width of your display. Of course you’ll need more than that to allow room to get in and out of the rig, not the easiest thing to do by the way. After using it for a while I found having the seat extended further than I need to drive, but sliding forward using the in-build sliding mechanism, allowed for comfortable racing and an easier entry and exit. Depending on your configuration, you’ll also need to consider cord lengths and placement of consoles and/or PCs. Thanks to the height necessary under the seat to get your driving position right, that also doubles as a great cavity to place devices and can save plenty of space. While it’s bigger than holding a steering wheel on your lap, this sim is efficient in the size it takes up. Personally I knew I wanted a proper, more permanent setup for racing and found the space along one wall of the home office. If you don’t mind screwing around, you can choose to fold the front section away when not in use, but seriously the space you’ll save is minimal. The only time I could conceive moving this rig is to put it in front of the largest TV in the house for a weekend. If that ever happened, there’d be no folding, just a two-person pit crew to move the rig as it stands. One of the biggest questions you’ll have is the comfort during the longest races. I think any racing simulator would be fine for a race or two, let’s face it, we’ve all raced Daytona at the arcade and never thought twice about the seat. After racing around Bathurst in Forza 5 and Project CARS, as well as racing multiple GPs including the HungarianGP in F1 2015, I’ve now got around 20 hours on the Next Level Racing GT Ultimate v2 racing sim. The good news is the seat is comfortable. The bad news is, you have to work hard to make it that way. At least harder than I was expecting. I get the challenge is a difficult one, with so many different sized and shaped bodies to support, but this is the same struggle car makers face. This version now ships with a lumbar support cushion, at first I thought it was too big and cumbersome, so raced without it. It wasn’t too long before I understood why this was included, from customer feedback. It straps to one of the three velcro removable sections in the seat. Being taller, I strapped it to the middle one, but this will absolutely be personal preference. With this in place, my driving sessions got longer and I stopped thinking about the seat and just kept reminding myself to breath. It sounds stupid, but when you’re racing wheel to wheel with a full grid of F1 cars, or chasing hundredths of a second in a lap time, it’s easy to forget. I know why the seat is as wide as it is, to accommodate the growing profile of Australian’s, but after experiencing Evo 8 Recaro’s in my road car, I’ve been spoilt with seat hugs. In terms of the monitor height, the steering wheel distance, I had it all wrong on first configuration. While it took a couple of days to dial it in, I feel like the rig is now working for me and a reduction in lap times is backing that up. When I purchased the GT Ultimate V2, the checkout posed some interesting questions, do I want a keyboard tray, do I want a controller and remote shelf, a monitor stand that can support up to 55” or triple displays. I appreciate that every racer is the same and having the bare minimum included in the rig and level the rest to optional extras, allows users to buy just what they need. Personally I did go for the monitor mount, but it’s currently out of stock, so will have more on that when it arrives. It mounts to the front of the rig so the ugly setup you see in the photos is just temporary until the proper solution arrives. With many common VESA mount options supported, it’ll support future monitors from the 27” I have up to 55” at some time in the future. What’s the damage on a racing simulator like this? Australian importer Pagnian has the Next Level Racing GT Ultimate V2 for A$849.00 which includes delivery. The optional monitor mount is A$179.00 which I think most people will go for, so the overall price just tips of the thousand dollar mark. There are certainly racing setups that you can buy that are half that price, but I kind of have a mentality on big purchases.. do it once and do it properly. I’d hate myself if I cheaped out on a rig that I’ll have for years and probably across console generations. If you’re really not constrained by budget, then there’s some seriously bonkers accessories you can throw at this. You can turn it into a flight sim for an additional $525.00 or add a Buttkicker vibration kit for between $649 and $949. Hands down the most insane mod is a $2,995.00 motion platform option. This connects to games and physically rotates both horizontally and vertically to give you the feeling or really feeling what it’s like to mash the loud pedal in a V8 Supercar. After pulling the trigger on steering wheels and pedals earlier in the year, my temptation to go to the next level with my racing addiction, finally took over. The capacity to be so precise as to run your front-left tyre over the white line before turning hard right is exactly what I was after. Only with that level of accuracy could I really do what all racing simulators should do, trick your brain to thinking you are actually driving. I think there’s still some room for improvement in terms of seat comfort, but the adjustability and flexibility in it’s adjustments are second to none. The GT Ultimate V2 is a big success and from researching V1, it’s a strong evolution forward on the platform. If you’re into racing, do yourself a favour, seriously consider getting into a simulator and if you do, consider this one. With a killer lineup of driving titles around in the middle of 2015, you’ll be hard pressed to find a better time. I played many, many hours driving with a controller in games like Forza 3, Forza 4, Forza Horizon, Horizon 2. Now I find myself going back to games I haven’t played in months, like Forza 5, but I know the game I’m enjoying the most right now is F1 2015. This weekend was the Hungarian Grand Prix and it was kind of fantastic to race the track, post my diminishing lap time on twitter and have friends compete to beat it. It was great to be able to compare my lap times to the actual drivers and the stunning qualifying time Hamilton achieved. This is the first time the official F1 game has shipped mid season and what a fantastic experience it is. At times over the weekend, I was racing as Aussie’s own Daniel Ricciardo in the Red Bull, with Foxtel Play snapped to the side of the Xbox streaming live Practice. That was a killer experience. There’s no doubt in my mind that if you pony up the cash, when you step out of this racing simulator, you’ll have a stupid amount of fun and a big, stupid smile on your face. Regular readers of our site will recall that a while back we reviewed the GTXtreme V2 racing cockpit from Next Level Racing. We were hugely impressed by it's build quality and value, but it was the immersion factor it brought to our racing experience that really won us over (you can read all about it here). For many the GTXtreme would be more then enough simrig to meet the demands of their virtual racing needs, but what happens when you have a few extra bucks to spend and want to get something just that little bit fancier? Next Level Racing are well known for their off the shelf sim hardware products. 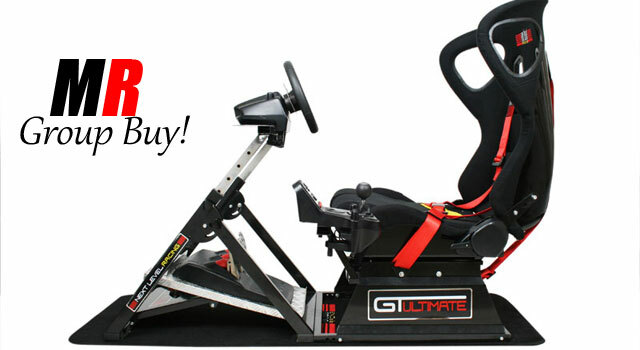 Their comprehensive range of wheel stands, cockpits and accessories cater to a wide range of users and budgets, culminating with the GTUltimate as their premium sim racing cockpit offering. We've always said here at ASR that dedicated cockpits add a dimension to sim racing that simply cannot be achieved with a wheel and pedal set alone. It's one thing to have that fancy Fantec or Thrustmaster wheel but if at the end of the day your dragging your office chair up to it then it's easy to feel like your missing that final piece of the sim racing puzzle. So the question is, does the GTUltimate live up to it's name? Is it indeed the ultiamte offering for sim racers? The GTUltimate is crated to your door in a single massive double re-inforced box that weighs in at an impressive 55KG (word of warning, couriers will not transport it into your house due to OH&S so be mindful that you'll probably want to bribe a friend to assist in moving it). Alot of the focus on the GTUltimate is centred on the replica bucket racing seat. While the GTXtreme used a leather seat that was modelled on more of a car type arrangement, the Ultimate goes one step farther offering the full body hugging bucket racing seat experience. The contoured back lining gives the illusion of a moulded carbon fibre seat while a full racing harness is also included just to add to the realism factor (potentially perfect if you plan on adding the motion platform option). They have obviously made some concessions to allow for greater comfort with the seat base being fully padded and an additional lumbar support cushion included. Overall the seat certainly looks the part and strikes a very imposing presence. Moving onto the rig itself, the key to its configuration flexibility is it's simplicity. The whole frame works off a simple 'A' type pivot system that allows the pedal deck to be adjusted, or if your purchasing just the wheel stand without the seat, potentially folding the entire rig away for easy storage. The GTUltimate has a fully adjustable pedal deck allowing it to be positioned on the fly and raked at different angles (useful for when friends come around who differ from your height). Originally I had concerns that wheel mounting system might introduce some wheel wobble but those where not realised and as a whole the base is extremely solid and works well considering it's simplicity. As you'd expect popular wheels from Logitech, Fanatec and Thrustmaster have pre drilled mounting to allow for quick installation. The pedal deck also fully supports the Thrustmaster TSR500 pedals in both the GT and F1 style arrangements. Lastly those who utilise gateshift accessories are also covered with an adjustable bracket that can be mounted on either side, or even from the wheel base itself. Just like the GTXtreme, the GTUltimate has a number of accessories and add-ons to complete your rig. The carpet mat protects your floor from any lateral movement while the keyboard and mouse stand helps to keep your peripherals within easy reach. One must have accessory is the monitor stand which functions as both a TV stand, or a triple monitor stand depending on your preferred setup. Finally for those with deeper pockets (or more understanding partners) the motion platform accessory adds actuators to your seat for the ultimate feedback system. We'll be bringing a full review of the motion platform in the near future so stay tuned on that front. Assembly is relatively straight forward, however the instruction set is severely lacking in detail and clarity. While I'm sure there are plenty of people out there that understand what an 'M8 x 15 screw' is, others would appreciate those items to be clearly labelled for easier identification. I certainly on more than one occasion had to remove bolts I'd just put in because I realised they were incorrect. One other point of contention for me was that while the pedal base is pre-drilled for Logitech G25/G27 and Thrustmaster T500RS pedal sets it is not for Fanatec ones like my Clubsport V2s. An included pedal stopper plate solves this, but we found that it impedes the V2's clutch mechanism. You could potentially resolve this by modifying the plate but this in my opinion is a curious oversight. I ended up resorting to drilling my own mounting holes to solve the problem which is not really ideal considering this is hardly a DIY product. Sitting in the GTUltimate is without a doubt a wonderful place to be. From the body hugging seats, the racing harness and comfortable driving position all these elements combined give a realistic immerse experience. It's adjustment options edge it out over the GTXtreme which had limited options in this area (something we pointed out at the time of review) and there is no doubt that this is indeed one of the premier sim racing products. The GTUltimate is a serious piece of kit and at $849 AUD it also comes with a serious price tag. If you already own a GTXtreme (or maybe similar type rig) and had no intention of moving to the motion platform, then I'd argue that the upgrade is marginal. If however your making the big step from desk to rig then I'd strongly recommend going straight to the GTUltimate. Yes it is more, but the additional configuration and adjustment options alone make it worthwhile, the bucket seat is an improvement over the previous one and once you get over some of the nuances and irritants of your initial setup and installation, you'll quickly forget them as you get on with the job of driving. With the motion platform available (all be it at an eye watering $3,999) it certainly gives you options for the future should you decide to take the ultimate plunge. Sturdy and adjustable pedal base. The best seat we've come across so far. No wheel wobble at all. Broad range of accessories and customisation options. Required some DIY work to install our Fanatec pedals. An integral part of making any sim racing or driving experience complete is a good cockpit. We’ve likely all done the bolt-on jobs where we’ve screwed our wheels to our desks and sat on our office chairs and while it’s fun, it just doesn’t feel real. The chair moves, the gear stick is in an awkward position, and it’s hard to feel like you’re in a real racing car when every time you stomp on the brakes your ‘car’ seat slides back. Enter Pagnian Imports and their Next Level Racing GT Ultimate V2 cockpit. I’ve been using this cockpit for nearly 12 months now and the wheel stand component for about nearly three years. In that time I think I’ve come to understand the setup pretty well. The GT Ultimate V2 in its complete form, as I have it, is comprised of a number of components: Wheel Stand, Monitor Stand (supporting single large screen up to 55” or triple 27”), desktop, keyboard stand, and finally the seat (and 4 point harness). My rig originally had a G27 on it, which over time evolved into a complete Fanatec clubsport set with Derek Speares button boxes and a custom dash. Out of the box, the GT Ultimate supports Logitech G27 and Thrustmaster wheels and pedals (and probably lower spec Logitech wheels too), and also the Fanatec Clubsport Wheel Base, which is great for the majority of users. The weighs in at near 50KG and takes a while to put together, so if you’re assembling one yourself, invite a few mates over and offer some of their favourite beverage. Once assembled, the GT Ultimate is an impressive package, about 1300mm long and 1500mm wide with triple 27” monitors installed. With keyboard stand installed, the GT Ultimate even simulates getting inside a real cockpit; some flexibility is required, even with the seat slid fully back. But it’s not too bad, you just can’t “flop” into the seat and get going, it’s more of a step. Once sat down, drivers can reach down to their left and pull up on the slide lever, as in many older cars (I think newer cars that don’t have electric seats have a full bar across) and slide the seat forward into their preferred distance. The seat also has a recline function, like real car seats, and you can tilt forward or back to your preferred angle. Assembling the unit, one thing that I found strange was that the seat frame comes with a number of bolt holes to allow the builder to set the desired distance from the wheel. I’m 5’10.5” (178cm) tall and I had to connect the very front bolts. I also slide the seat as far forward as possible. I’d hate to be shorter and be compromised in my preferred driving position. As mentioned earlier, the rig can accommodate a Fanatec Clubsport Wheelbase, but I found I had to bolt mine on by only the two ear connections in order to move the wheel forward a bit more and get the desired distance from my torso to the wheel. I do drive with my arms bent though (as the racing books instruct). The seat itself is an impressive piece of kit, a proper replica racing seat with fibreglass backing. Pagnian have included thee foam inserts of varying thickness, all of which are used to provide customised lumbar support. Personally I had to go and purchase more memory foam from my local craft store and provide extra lumbar support and move me yet close to the wheel and pedals. I tried without the lumbar support but I felt instantly uncomfortable and within 15 minutes I had had enough of driving and trying to make it work. That was in January and in August Pagnian released a new lumbar cushion to help with this problem. The gaming desktop is great addition too. With that installed I can rest my buttkicker controller, headphones, mouse recharger and other occasional items (my mobile phone and snacks). Well worth the addition. I can’t say the same about the initial version of the keyboard stand. The initial version bolted on to the side of the seat and swing around. It was also affixed on top of the harness on one end, which meant the other end was lower. It made for simple entry to the seat but I found it was always swinging back of its own accord and it was never flat. Because it wasn’t flat it wasn’t viable to use long term, like if you want to type a review, or play your favourite 3rd person shooter in the event your simrig is your only PC at home. The keyboard tray kept swinging out and extending the arm and over time the weight acting on a lever (the arm) applied a torque to the small piece of metal that was screwed in and it twisted right off. Fortunately Pagnian released a new keyboard arm which bolts into the front of the seat and in secured horizontally in two place reducing the axis and amount of torque that can be applied. It also meant the keyboard tray is perfectly flat and you get the added bonus of climbing into the rig. This cockpit ticks every box except motion. Unless you're going for a $20,000+ build, the GTUltimate V2 is the ultimate cockpit. Speaking of previous versions of components; I have version 1 of the wheel stand, purchased in late 2011. A few months ago my seven year old daughter was in my rig (bad I know, but I like to encourage her driving every now and then) and she pulled down on top of my wheel to get up. I heard a loud pop and the horizontal bar to connecting either side of the wheel stand and on which the wheel is bolted had come off. On investigation I saw the connector, which was fastened by two tiny spot welds had come off. The spot welds had popped off the frame. Once I received my new crossbar I noticed two things: The connected was much more solid, and the spot welds were now continuous welds all the way around. The previous things might sound bad for Pagnian and the Next Level Stand but I have had the wheel stand for nearly 3 years and this was the first defect I had encountered. The other, more important thing to note, Pagnian have listen to feedback made to them and improved an already good product significantly. While I’m no engineer (actually, I am an engineer – a software engineer – but I digress) it seems the design and manufacturing of the improved components will ensure a solid and robust product for years to come. Still on the setting up: I did have a problem installing my Fanatec Clubsport pedals. There are no bolt holes for this pedal set (V2 is the same – I now run with those pedals) and I had to get creative with my power drill. The solution was to drill another hole and affix only one side. In the 18 months I’ve been running with this solution I’ve never had the pedals move on me, so I think it’s an easy fix and the rig cannot be expected to accommodate every single piece of equipment on the market. Oh yes, if you own the Fanatec Clubsport shifter (SQ or normal) you’ll need to also purchase the desk-clamp or you won’t be able to mount your shifter without using more handyman skills than I possess. Finally, with all that mentioned, once the rig is setup it’s one sturdy piece of equipment. The pedals can be slid further or close from you, the seat can be slid further or close from the wheel and tilted to the desired angle, with everything other than an adjustable steering column found in modern cars it’s easy to find the a comfortable driving position for those long sessions. I’ve done a few 2.4 hour races in this rig and I can attest that while I was exhausted when the races were done, the driving position itself didn’t contribute to that. That’s impressive coming from someone as picky as me. I mentioned I’m 178cm. I’m also 100kg and rather wide across the shoulders. I mentioned the rig is solid didn’t I? The monitors do not shake or move when my CSW is going mental during. Things may shake off the desktop (like spare gear knobs…) but the monitors don’t move. Oh I forgot about one other thing that broke. After about 4 months of buttkicking action, the pole the buttkicker is mounted to under the seat clean snapped off from where it was bolted to the rig. I do like my vibrations. I did get another pole though and I have seen most setups like mine have multiple buttkickers and they’re mounted to the frame itself rather than a small pole. If possible go that route. I will be, soon. Finally, the four point harness; it sounds a little geeky (it is) but I love racing with it on. I like being pulled firmly into the seat as my rig rumbles and shakes beneath me. If you don’t have it, get it. Overall it may sound like I am disappointed with my rig but that’s not the case. It would be fair to say it gets a workout every day, and a strenuous one at that. Given the improvements that have been made I see this rig lasting a long time in the future without problem. If there are problems (or even improvements) I have complete faith in Pagnian Imports to resolve them in quickly and in a positive manner. I don’t see myself getting another rig at any time, except unless I want a full motion solution and there’s no Next Level Racing add on for that! I've had the new GTUltimate rig since release and I've been using it for quite some time, but haven't had a chance to get a review up, I thought I really should before Christmas hits because this is worth looking into. I'll start off by saying it's a great product, I don't think I'm faster at all, but I don't have to keep adjusting seating positions or move the wheel stand any more, I get in and off I go. It pulls apart into two manageable pieces, so when people come over all they see is a racing seat in the corner and knowing me just think it's me being a racing nerd. Without this feature I don't think I could get it around my apartment. Delivery was smooth, the day after release, it was delivered in the morning by Toll from QLD, luckily I had the day off to play. It's a big box and weighs in at 35kg. It's packed in 2 boxes so very much protected. Putting it together is pretty easy, one person can do it, the adjusting will take you a bit longer. The seat is just two side plates and a front and back brace. The front brace is fully adjustable. Being tall 6'4" I thought I'd need it all the way out, not the case in the end. You can adjust these when it's all hooked up with relative ease. You can adjust the seat angle a bit but moving these bolts on the side. In the end I moved the front all the way to the top and the back to the bottom for a slight recline. The seat fabric, base and back padding is all head in place by Velcro so getting to the bolts is easy enough. It is though a finicky job. The wheel stand is the v2 version and joins to the seat with 2 long bolts. The stand hasn't changed much but it doesn't need to as it's a great stand way better than the Rennsport Fanatec one. I did discover that the manual seems to point the wheel plate out over the pedals this is actually incorrect, it should go the other way facing towards you. Put the wheel on first before attaching the plate to the stand. Most of the bolts use allen keys and 13mm spanner so pretty easy. The Gear Shifter adapter and plates you will get two of, one with the seat and the other with the stand as you can attach the shifters to either of them on either side what ever suits. End result is it looks like this, I haven't tidied the cables up properly in this photo, please ignore and I don't have shifters. It took me a couple of days to get my seating position just right. Getting the right leg and arm distances just takes a bit of time to dial in, due to the seat and the pedal base both being able to slide. Once it's in just know which notch you lock the seat in and off you go. I suggest not moving the pedal plate once in place. I actually used old HDD's to give shorter people access. Everything else is easy enough to adjust and remember. Construction is rock solid nothing moves, wobbles or flexes on it. I pull the whole rig forward right up to the TV screen and back every night at least once. I never get distracted by any shifting of couches, and stands any more and I think in general that helps my concentration and immersion more. The seat by itself might rock a bit before you sit in it but after that it settles nicely. Rubber pads underneath are very good. Some things to consider with this rig, the racing chair will not be for everyone. It's very snug for me at a 37 inch waist, I disappointingly discovered yesterday, Brett from Pagnian says it can accommodate a 38-40 inch waist max. If you use Kinect for head tracking it will not work with this seat, I've tried everything and the headrest just stops Kinect from working properly. That said I'm not missing it that much any more. Because I'm a bit of a sloucher I can get a stiff back from this sometimes just because there is less lower back support, but that's just me, as I don't have the lumber curve sitting straight has never been all the comfortable for me. That said I'm about that stiff after being in the car for that long too, so have had no issue being in this rig for 6 hours. The Clubsport Pedals still only sit on the pedal plate, but I haven't found that an issue so far. I might at some point attempt to bolt them to the plate and drill some holes. Right now I'm happy the way it is. Pagnian support as always has been great I've heard and this was no different. Brett touched base the whole way along as it was new kit, and answered all my questions very quickly. OZFM do get a discount of $50. People who already have a stand can just buy the seat I believe. Final Words: It's not cheap at $799 and the seat isn't for everyone but after comparing it to so many other rigs out there this one has more options than most. In all likelihood I will eventually make it a self contained rig with a big screen and Xbox attached to it, in a gaming dungeon sometime in the future, it has that flexibility and that is one of it's many great points. Hope this helped, sorry if it's overly detailed, but I thought due to the expense it's good to know what you are getting. If you have any further questions let me know. Last week I had the pleasure of trying out the Pagnian GT Ultimate Next Level Racing Simulator at their office in Lachine. For those who are not aware, Pagnian is world renowned for building high quality simulators and has recently expanded from Australia into North America. Pagnian Americas is run by none other than long-time MontrealRacing.com member Babak. When you sit in the Pagnian cockpit you immediately notice the quality of the build. The seat hugs you and holds you firmly in place and the control are perfectly positioned. In front, the ultra-high definition 4K LCD puts you into the game of your choice via a PC or any other gaming console. I played Gran Turismo and it was incredibly real. So real that if I crashed my whole body tensed up as if I were in a real car about to crash. The Next Level Racing Game simulators are the most advanced racing car simulators on the market and have been featured in Top Gear, Gizmodo, Games.on.net, Crank and Piston, Alpha Magazine, TeamOz Racing, ARL TV and more. They are not only used by gamers but also professional drivers. I am a race-game nut! For years, I played rFactor with my Logitech G25 screwed onto the desktop and I had no idea what I was missing out on. Sure enough, it did the job – my driving improved and I noticed a difference in my lap times, but I still wasn’t getting the full slice of the cake. After doing a bit of research online I quickly realised that the GT Ultimate Next Level Racing Simulator was the way to go – Australian built, excellent price and the quality and design ensures for a good investment. The sense of immersion from the GT Ultimate simulator is phenomenal. It really rivals that of a real race car cockpit. The bucket seat wraps around the driver providing extra sensation of being in a car. Not to mention the three 23-inch monitors that cover well into the drivers’ peripheral vision - this would have to be my favourite feature on the GT Ultimate as it increases the sensation and increases the enjoyment of door-to-door racing online. The build is absolutely top quality. The whole rig is compact and doesn’t waste any space. To keep the room looking tidy, a computer, PlayStation or Xbox can be stored under the seat. It’s also strong enough to support three monitors securely. One annoying thing I had to put up with when playing the G25 screwed onto the desktop was how it would occasionally come loose during a quick movement. All this has been resolved as the GT Ultimate comes with pre-drilled holes to allow for hard mounting the wheel, pedals and shifter – you can be assured that every movement or vibration will not cause the wheel, pedals or shifter to move. Driver comfort is quite possibly the upmost important factor in determining how quick the driver can go. The GT Ultimate has no shortage of adjustability and allows for a whole range of driver sizes. 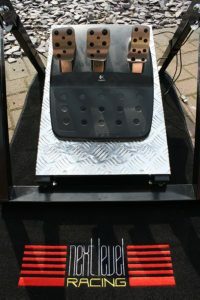 The height and angle of the wheel is adjusted via screws on the wheel mount, the distance and height of the pedals is tweaked on the pedal platform and seat slides back and forth like in a real car to allow for the perfect position to make sure you can drive those virtual laps as fast you can! Now getting down to the real world improvements I’ve experienced from playing the GT Ultimate. As I said before, I am a race-game nut and spend a good few hours a week playing rFactor and the like. Back in my karting days (pre-GT Ultimate) dad noticed an improvement in my driving style after I’d spent time behind the wheel of the G25 and having a steer. Now that I am racing in the Australian Swift Racing Series with the Shannon’s Nationals, it is more serious and I use the GT Ultimate Simulator to learn the tracks before I visit them in my Swift. I believe this has certainly paid off as I scored my first career Pole Position and the lap record at Winton, and Second at Queensland Raceway after spending hours on the simulator in the lead up. Having the extra sensation of the three monitors and the bucket racing seat makes it feel that much more realistic and I highly recommend the GT Ultimate to any simulator enthusiast through to weekend race-day warriors. The entire Next Level cockpit setup was delivered in a variety of thick, well packed cardboard boxes. The big box on the bottom contained the seat and the pedal board while the smaller boxes on top were separate modules for the keyboard stand, monitor stand, and gaming desktop. You’ll notice the big box also says “NEXT LEVEL RACING.” Indeed the chair itself, the floor mat, and other parts of the cockpit also say “NEXT LEVEL RACING” as these are the same units that make up their racing cockpit. It’s really just a cosmetic thing and doesn’t affect the setup or enjoyment of the cockpit from a functional stand point but certainly it could be a concern for some. In the future Pagnian will probably make “flight”-flavored accouterments if the customers demand it. Opening the big box we find the seat itself and a couple boxes. The seat itself is folded up and like all the other hardware pieces of the cockpit it is wrapped neatly in bubble wrap. The smaller boxes contain the pedal stand and the flight accessories module. Once the chair is folded out and the base plates are attached, it’s really quite comfortable and should fit any size pilot. It has separate foam sections on the back with velcro so you can place them as best suits you. It also has a lever underneath to adjust your distance from your monitors. Now let’s open up the flight accessories box. Like all the other hardware parts, the elements in this box are coated in a heavy duty glossy black powder and bubble wrapped. Certainly sturdy enough for your HOTAS or other flight sim gear. Above you can see various panels, the square ones come pre-drilled to hold your X-52 or X-52 Pro. (X-55 Rhino plates are coming soon.) Using the long bars you can set your throttle on the left and the stick on the right, or the throttle on the left and your stick in the middle. The directions are simple to follow; if you can put together an IKEA cabinet you can put together this cockpit! And here’s how it looks all put together with a monitor, X-52 Pro, and the keyboard stand. It truly does bring your gaming experience to the “Next Level.” There’s plenty of room on the keyboard stand for panels and FIPs as well. You can also swap out the center keyboard stand for the side swivel keyboards stand if you wish. Early last year I was on the hunt for a simulator that would help me get keep up my time in the seat between races and when it wasn’t convenient to get out to a test day. After doing my research I realized that the Next Level Racing Wheel Stand was the perfect option for me as I had very limited space and needed something that could easily be folded away into the corner when I was done. It was about 12 months ago that I first met the helpful guys at Pagnian Imports and handed over my money in exchange for a rather heavy cardboard box. After getting it home and unboxing my new toy, it became obvious that what I had was well worth the money. The build quality of the stand was immediately obvious and my Logitech wheel, pedals and gearshift were able to be hard mounted via the predrilled holes. There was more than enough adjustability in the stand to set the wheel at the height and pedals at the correct reach and height that would suit my desired driving position upon whichever chair I decided steal from about the house. The weight of the stand helped to ground the setup in front of my plasma so much so that I found the chair constantly pushing back away from the stand across my timber floor. Right, my new stand is too good for this sort of shenanigan mid race. Cue call no. 2 to Hess and the guys at Pagnian. Hess set me up with a Next Level Racing floor mat that would serve 2 purposes. I didn’t have to worry about the stand in any way scratching my floor (not that it did anyway thanks to the rubber feet that came standard), but also to help give my chair something to grip to whilst I was mashing the pedals. Whilst I was at it I decided to add the triple monitor and then went and pick up three shiny 23” screens to help me achieve a more immersive experience not readily achievable with a boring flat screen. 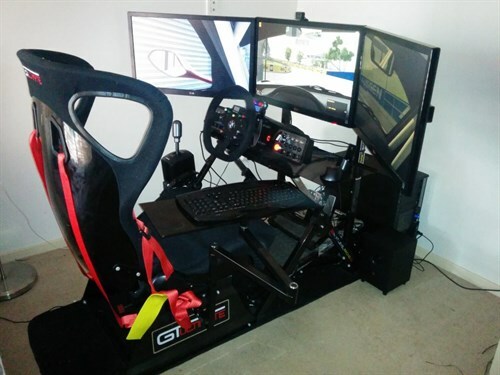 This setup kept me occupied for a good few months and happy as I was with my rig, racking my seat time up, it just didn’t quite cut it in terms of immersion or realism in that I was literally driving in a dining room chair. I recently paid Pagnian Imports another visit, hoping they could help ‘complete me’, well my rig at least. I walked out with a kit to make my Wheel Stand into a bona fide GT Ultimate Racing Simulator. The kit comprised a racing seat, sliding rails, seat mounts, gearshift mount and the frame onto which the seat attaches, all of which then mates up with the Wheel Stand. As I had an early model Wheel Stand I had to drill holes through which to bolt the seat frame (also with the monitor mount) however I understand the Wheel Stand now comes pre-drilled. What a difference a seat can make. It is adjustable almost infinitely in reach thanks to a variety of bolt holes and sliding seat rails, and also in height by way of three different height holes on the side seat mounts at both the front and rear of the seat, thus allowing you to also adjust the tilt of the seat. For me I was trying to achieve a position most like my Aussie Racing Car, which meant setting the seat on it’s highest level. With my monitor mount at its lowest level I found this to be the closest setting to what I’m used to. Once all of the adjustment was done I fired up the PC and gave it a crack. What a difference a seat makes. Not taking away from the entire GT Ultimate system, it was just what the doctor ordered to complete the immersion experience. The helmet restraints on the seat in conjunction with the wrapping around of my screens helped close the simulator in such that I was oblivious to my surroundings. With only a few laps under my belt of Queensland Raceway (my next race destination in the Aussie Racing Car) I found myself instinctively leaning into turn 1 and 2. The seat kit includes a mount moves the gearshift from its wheel stand mount, down to a more natural position beside the seat. I don’t find myself missing gears now and can focus more on what I should be doing (no I don’t mean mowing the lawn) rather than making sure I get it into the right gear. This is what I was looking for when I first began searching for a simulator. Something that felt realistic enough that I could legitimately use it to get real seat time and help with my driver development away from the track. What astounds me even more is that in the design of this system, thorough consideration was given to ensure that you can either upgrade through stages like I did, or just pick the pieces that you want to suit your own situation. Right down to the necessary bolts and nuts, it all just goes together like an IKEA bookcase. I couldn’t be happier with my GT Ultimate Racing Simulator, money very well spent in my eyes, and a tool that I have no doubt will be instrumental in my endless development as a race car driver and is sure to improve consistency and reduced lap times when I’m behind the wheel of my Aussie Racing Car, or any race car I drive in the future. I’ve wanted a car simulator cockpit for a lot of years. I’ve had a steering wheel for my PS3, but without a proper rig to set it up with it was pretty much useless. I had a table and a bean bag which worked, kinda, but not all that well. So when I saw these Next Level GT Ultimate Simulator Cockpits on Facebook, I punched an email off in the slight chance we could give one a whirl. When it arrived it was like all Christmases had come at once. The Next Level GT Ultimate is the most advanced on the market and has been in the works for more than two years. It’s bursting with features including a full-blown race seat, a solid design and my favourite — it can be separated for easy transport or storage. All major steering wheels are supported with this simulator and it can also support three 27-inch screens or a 55-inch screen. It can also be converted into a flight simulator or a gaming cockpit for your computer, all with optional extras. I’ve been playing this thing flat out; it gives you a true “in-car” feel and is awesome for games like F1 and the dirt rally series. The whole system is rock solid and no matter how aggressive you get on the wheel and pedals it keeps its form to offer a true simulation. The seating position is fully adjustable so it will fit every shape and size, so you can’t hog all the fun for yourself. Troy has been an avid flight simmer since 1982 with the release of the very first Microsoft Flight Simulator. He has worked in the Information Technology field for over ten years and more recently taken on the role as Simulation Support Specialist for Bohemia Interactive Australia, the manufacturer of VBS2 used to train militaries around the world. Troy continues to pursue his passion for flying both in a virtual environment and real life environment. He currently flies with Flight Sim X, the full range of Digital Combat Simulations titles such as A-10C, P-51D, BlackShark 2, and Flaming Cliffs 3. He also uses the Next Level Flight Cockpit and three monitor configuration for Battlefield 3 and Arma 2. Class yourself as a flight simulation enthusiast? TrackIR head motion tracker, Thrustmaster Warthog HOTAS flight controller, CH Pro Pedals and even the Flight Yoke adorn your little corner of sim heaven? For all flight simmers the ultimate conclusion to the home setup is your own personal simpit. Simpit? The Simpit is an abbreviation for simulation cockpit. It’s a place to house those expensive controllers you have invested in. To envelope your senses with sound and multiple screens. To sit comfortably whilst shooting through the sky at Mach 2 or slowly descending on final to your local airfield in a Cessna 172. I’ve been flying simulations since the very first Microsoft Flight Simulator in 1982 and all these years the idea of my own cockpit has been nothing more than a dream. Over the years I’ve seen some incredible homemade simpits, from SU-27 fighters to Boeing 737 cockpits. But alas my ability to construct something that intricate, time consuming and technical is beyond my skills. So there I was surfing the internet before starting my day of work when lo and behold I come across the Next Level Flight Simulator Cockpit sold by Pagnian Imports (www.pagnianimports.com.au). To say that I was excited would be an understatement, here was an affordable simpit being sold right here in Australia. My only question, what is the quality like? You, like me, have probably seen these simpits before in driving sim configuration and they are very popular with that market segment. Immediately I contacted Pagnian Imports and a week later I have the pleasure to be reviewing this product. For any product to be successful it is essential to have quality support at all levels from pre-sales right through to after-sales. There is no point in having a fantastic product if there is no communication or support from the manufacturer or distributor. From the outset I knew Pagnian was going to be a pleasant experience as a customer. The website states that the Next Level Simpit will ship within 24 hours of ordering, and it ships completely free. They also state that all enquiries will be answered within 24 hours. My first contact with Pagnian was via their facebook page where I posted to ask if anyone had reviewed the cockpit. My enquiry was responded to within the hour where I was told that someone from sales would contact me shortly to answer my enquiry. I provided my email address and in less than an hour I had an email from them. Pagnian have lived up to their claims from the outset, they are professional and prompt in their correspondence. My cockpit was shipped the very next day as promised. Whilst we had some courier issues the staff of Pagnian were fantastic at getting it resolved despite being in the middle of an office relocation. I arrived home from work to find four boxes, one large box obviously containing the fibreglass bucket seat, one long box with the monitor stand, a box for the flight accessories and the final box for the keyboard and mouse tray. I’m certainly glad they provide free shipping as this alone would cost a significant amount of my cash with any courier. So the ordering process was easy, communication good and despite a hiccup with the courier everything went smoothly. The next challenge was getting it assembled. For anyone who has had to put together those flat packed office desks or one of the countless other products made cheaply in Asia with poorly written instructions you will understand my trepidation when I saw the work involved in assembling the cockpit. But fear turned to confidence as I saw how each part was carefully protected in bubble wrap. I quickly found the first instruction manual and was even more pleasantly surprised to find it well written and easy to follow. The instructions list all of the components included and you are provided with all of the tools required. The frame is extremely sturdy and thickly powder coated black in colour. The welds are all clean and tidy with no sharp protrusions. In fact is so sturdy that the frame easily supports my large build comfortably with no sign of weakness. Add a bucket seat that is one piece fibreglass with good stitching and a protective trim around the ventilation holes at head height. The cushions are comfortable and secure in place by velcro that is attached to the seat. The seat can also slide back and forth along the mount, much as a car seat does. And best of all it ships with a mount for the Buttkicker which adds a whole new dimension to gaming by shaking the living daylights out of you in response to explosions, bullet hits and so on. Unfortunately I didn’t thrash out on a Buttkicker, maybe next time, but I’ve had the pleasure of using one a few years ago. Assembly was for the most part painfree, in fact there are plenty of spare bolts just in case you lose one or two. In putting the monitor stand onto the frame I thought I might leave extra room between the seat and the displays so I placed the stand in reverse (as listed for a single display). However after doing this and putting up two of the screens I decided they would be best as per the instructions. To change them did not take long but my recommendation is certainly to follow the instruction manual. The only issues I had were with the monitor stand and the lack of detail in the instructions for the stand. One of the monitor arms required a hole to be drilled which I found very odd considering the quality of everything else. I also found the two side monitor arms to be angled oddly, however with the assistance of a friend who stood behind and made adjustments they now sit perfectly. So my advice for others is to get an extra set of hands to help. With my setup the side monitors have their bezel sitting over the middle monitor so that way there is not a much of a gap. Besides those very minor issues with the monitor stand as you can see in the photo above it all came together beautifully. The mounts for my Thrustmaster Warthog HOTAS lined up perfectly. I did end up not bolting the joystick shaft into the middle as I find with my size it becomes difficult to get in and out of the seat, others most likely won’t find that. Though I would love to see the cockpit come with some form of quick release for that support post. I also discovered that it is best to put the mat if you purchased it down first, then build the cockpit on top of it. As trying to get the mat underneath afterwards is awkward to say the least. So the build process was not too bad what about the gaming? Now this is what we all want to know. The rigid bucket seat holds you in comfortably and adjusts on sliders back and forth to enable optimum positioning. The cushions that you sit on can be repositioned via velcro which is also a plus, and they are very comfortable for hours of gaming. I plan to attach my 24” touch screen below the main monitors for use as an instrument display. Unfortunately the leg arrangement on my AOC monitor means I will need to make some kind of platform up that attaches to the height adjustable flight yoke bracket. And finally the only other thing that I would possibly change would be the height of the keyboard/mouse tray. If you also play other games, such as first person shooters, or just want to draft an email, then the height of the tray makes it uncomfortable on your wrists after an hour or so. Not a major issue and certainly not a game breaker but one for consideration. That being said it is very easy to lose yourself in the virtual world of your choosing in the comfort and surrounds of the Next Level Flight Simulator Cockpit. * I would rate it as a 10 out of 10 and perfect addition to any serious gamers kit if those minor issues were not present. Overall though I would definitely recommend this product. I must say, when the Next Level Racing GTUltimate racing rig from Pagnian Imports arrived my first impression was “WOW” what a rig. The assembly was so easy with the simple instructions and all the tools,bolts,nuts and washers supplied. It took me about 35 min’s before I was ready to put the GT-Ultimate through it’s paces. The seat itself is so comfortable I done a 2 hr practice session driving the V8 Supercar around Brands Hatch on iRacing and I did not want to get out of it!The rig is firmly planted with no movement what so ever due to it’s design and with the help of the rubber grip pads. The fitting of my G27 wheel,pedals and shifter was so easy because all the pre-drilled holes to suit lined up perfectly. Because I am a bit short in stature I have had to rely on a pillow in the seat in other rig’s to get everything in reach.The amount of adjustments you have with this rig can suit any size person. The seat has 3 height adjustment holes,easily done just 4 bolts. The shifter can be moved around to suit short or long armed people,one of the things I had to mod before but could adjust this one where ever I needed it. The sliding plate for the pedal’s is fantastic,allow’s for a great deal of adjustment and is made of solid aluminium chequer plate. The height and angle adjustment for the wheel is the same with an incredible range of adjustment. With the inclusion of the ButtKicker vibration attachment and even the velcro straps to keep all the wires from your wheel tidy the GT Ultimate is a great package. The whole package is made with precision and is very well made. The construction is very strong and is very good value for money. I’ve been on the lookout for a cockpit to hopefully improve my times, but definitely improve my overall enjoyment. I toyed with the idea of getting a model with an inbuilt seat but there’s both the high price and the size factor. I’ve got an L shaped desk and I had just been clamping my G27 wheel and gear stick to that, with the carpet providing some resistance to nearly hold my pedals in place. It doesn’t quite work though and often during a racing I’ll be trying to drag the pedals back to their optimal position, or worse yet, trying to very quickly reattach my steering wheel to the desk after I yanked it free in a hard bout of opposite lock. I play a fair bit of games that use the H-shifter and I’d also like to have it in a more natural position, down lower near my leg, rather than on the same level as the wheel. My solution to this problem, given all the parameters, was the Next Level Racing Wheel, a sturdy frame that provides mounting points to screw in a G27 kit, wheel, pedals and shifters. The package arrived via rather large cardboard box, almost fully assembled. The out of the box experience was great and the frame was of high quality solid construction with an attractive pearl black enamel finish. The only work on my part was fixing the gear shift lever on my preferred side (left) and then attaching the G27 components using the supplied allen key screws. All hole lined up perfectly and all screws went in with minimum of fuss, a positive sign of a quality build process. Another bonus, which I found thoughtful, was the inclusion of four velcro strips which I used to tuck the various cables of my G27 into the frame. After about 15 minutes of assembly I was plugged in and doing laps in my favourite racing simulator. The first few minutes of driving were spent adjusting the pedals, sliding them further back, and raising the height of the wheel, which also raises the height of the gearshift. The wheel height extension arms have holes at regular intervals into which you can screw a bolt, but I found it possible to still have a sturdy setup with the screws firmly screwed in against the metal. A few laps of hard driving later and I was impressed. The entire structure is solidly planted to the ground, a combination of the weight of the unit and rubber feet preventing movement on my carpet floored ‘study’. I was also able to be very aggressive with all of the pedals, gearshift, and wheel without them moving; the hand screw adjustable pedal base remaining locked. When I’m not playing racing games I simply unplug the USB cable from my PC and drag the frame off of the side. It also folds up vertically so it can be stored in a cupboard (or under a bed? ), for those people who have their PC’s in a more open space or use it for a wheel on a console plugged in to their lounge room television. Overall I give the unit 5/5 and I’ve got no complaints with what was supplied. If I could do anything to improve the package it would be to provide a way to secure the wheels on my chair to the frame, at a positioning of my choosing. This would ensure a perfect driving position. Presenting our review of the Next Level Racing Wheel Stand. Here’s some specs on the stand..
– Tools included for assembly. Can fold down to store upright or slide under a bed. Besides needing a chair that is low, this stand is probably the best we’ve ever tried. It does come at a higher price than some that we’ve tried, but you get what you pay for. Stability is worth the higher price tag. Comes with everything you need to hard mount your wheel, pedals and shifter so you can unpack and start racing. In closing, this wheel stand is more stable that some of the full rigs we’ve tried. Really anxious to try it with the seat attachment. GT Academy is rolling up to Race Camps at the end of another year of competition and there’s one thought hitting the minds of those of us who didn’t qualify… “I’ll get a wheel set up and qualify next year”. As luck would have it, Pagnian Imports has sent us across their Next Level Racing Wheel Stand to test. First impressions of the stand are fair. It’s a pretty heavy piece of kit and comes bundled with all the nuts and bolts (and washers) required to fit just about any brand of wheel to it, along with adapter plates for the Thrustmaster wheels. There’s big, chunky bolts provided for the main adjustment options and to collapse the stand away in pretty short order, so there’s no fiddling about with tools – though you will need a 13mm spanner or socket to secure or detach the wheel mounting plate. The plate can’t be adjusted for angle however, though you can achieve some tilt by using supplied washers as bolt spacers. Aesthetically it’s reasonably pleasing too. The majority of the stand comprises 10cm2 steel box section finished in a nice gloss black with the occasional Next Level Racing branding sticker. While I’m not the world’s biggest fan of the shiny chequerplate used for the pedal base, it does the job and is, again, drilled to provide hard mounting for most types of pedal boxes that can be mounted. For those that can’t there’s an L-shaped bracket included that can be fixed to the front to prevent the pedals sliding off the end under particularly panicked braking. The whole base slides backwards and forwards for the longer and shorter legged gamers. The gear shift mount can be positioned either on the left or right, with a reversible Z-shaped piece of black box section slotting into the ends of the horizontal bar – a plastic blank is provided for the unused end to save on skinned body parts. I found that mounting the G25 shifter to the plate before attaching it to the Z-section resulted in interference from the mounting bolt, so be careful in which order you assemble things! There’s a couple of nice touches here too. With our wheel stand, Pagnian included the Next Level Racing embroidered roll mat which you can toss out onto your floor to save hard surfaces from your driving efforts – and the mat’s long enough that you can put a seat onto the back (or the Next Level Racing GT Ultimate) and keep the stand and yourself the same distance apart. Also on the good idea list is a set of four velcro straps which you can use to secure the many, many cables in place – no more inviting loops of electricity to snare with your feet. Driving the Wheel Stand is just like driving a full rig – something of a revelation considering this is a portable stand. Despite being a foldaway design, the two-post construction, good, wide-footprint and significant weight means that this effectively portable, temporary stand does not move. Avoiding the centre post style also means you have complete freedom of movement with your legs and feet, so those of you who like to heel-toe will be entirely satisfied. Despite being a folding stand, it’s not so much of a portable piece. You’ll almost certainly need to detach the gear shift bracket (which is pretty simple) and probably the pedals and wheel too in order to store or stack it and the physical dimensions mean that, unlike some other portable wheelstands, it won’t fit in the boot of my MX-5. There’s also the sheer weight – it comes in at around 18kg (40lb). With thanks to Hess at Pagnian Imports for providing GTPlanet with this review unit. As you know, our sponsor Pagnian Imports has very kindly donated a prize for OZFM's current V8 Supercar Series. You will find the product information HERE, it has excellent pictures of the stand and the adjustments available. It also details the full list of features on the stand. This is my review of the wheel stand and prize that some lucky player will receive at the conclusion of OZFM V8 Supercar Series VI. As background, I've been racing Forza Motorsport for 3 years and have used a number of home made race rigs during that time. Originally using a Microsoft wheel and now a Fanatec GT2 wheel with clubsport pedals. Delivery was by courier to my door, the stand was safely packed in a cardboard carton. Packed size is 64 x 15 x 74cm which is quite compact for a wheel stand. Unpacking took seconds, inside the carton was the wheel stand and a box of small parts. The parts included wheel mounting plates, gear shift adaptor, assembly parts and an instruction manual. This is a nicely built stand, construction is steel tubes and plates, except for the aluminum pedal base plate. The main frame is painted in a black metallic finish and carries some Next Level Racing stickers, the height adjustable wheel supports are chrome plated. All screws are plated and all adjustable parts are located and retained with hand tightened locking knobs. The stand is well braced and feels rock solid to handle, it weighs around 12kg. A quick look in the instruction manual and you know assembly will be almost too easy. The wheel mount plate is pre drilled and assembly parts are supplied to mount Logitech G25/G27 wheels, pedals and gear shifter. Also the Thrustmaster T500 RS wheel and pedals and all Fanatec wheels and pedals. The stand is pre-assembled, so you only need to swing the base into the open position. 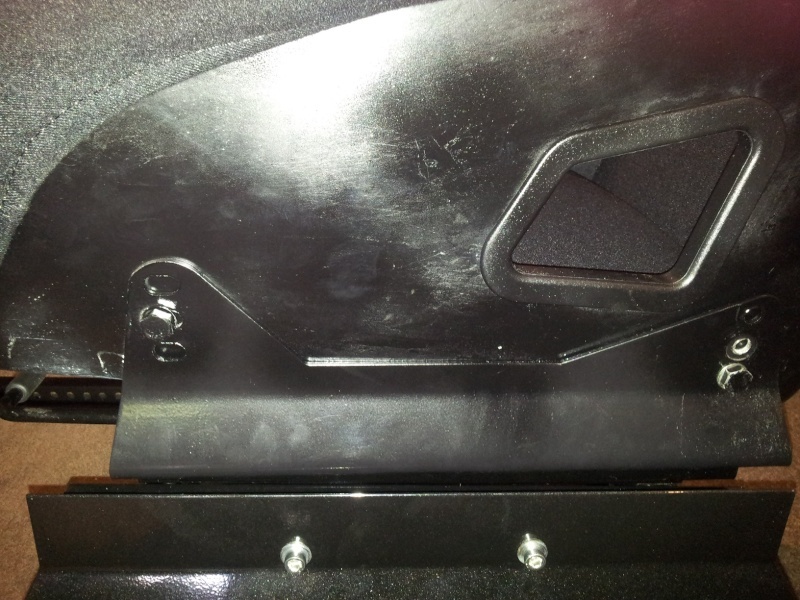 Then mount the steering wheel base plate to the top bar of the stand, (2 bolts). If you're using a Logitech wheel and shifter for PS3 or PC gaming you can mount the gear shift adaptor supplied on the left or right side of the stand, in a fairly natural H pattern gear lever position. The Fanatec GT2 wheel bolts directly onto the base plate using 4 screws supplied. The Fanatec clubsport pedals sit loose on the pedal base plate and are held in position by a pedal stopper plate. The gear shift adapter on the stand is not compatible with Fanatec gear shifters, so I used the standard Fanatec shifter mount. I also checked my Microsoft wheel and found the wheel clamping assembly is compatible with the wheel base plate on the stand. A packer under the wheel clamping bolt would make clamping quicker, or you could use the included T500 RS adaptor plate for this if you like. The Microsoft pedals sit loose on the pedal plate and could be held in position using the Fanatec pedal stopper plate. I think most players could find a comfortable driving position in anything from a lounge chair to a dining chair, I tried both. When using a low chair I ended up with a high pedal position which was more like an open wheeler than a sports sedan. It was more sedan like when using a dining or office chair. Adjustment of the stand was easy with both the chairs I used. Firstly, adjust wheel height and lock it in using the locking knobs. There is about 36cm of wheel height adjustment to handle a range of chair heights. Next adjust the pedals. There is about 20cm of length adjustment in the pedal base plate which is inclined at about 15 degrees. Place the pedals in the desired position and tighten the pedal stopper bolts to keep the pedals in position on the base plate. Now loosen the pedal length control knobs and adjust the base plate to a comfortable pedal position and lock it in using the locking knobs. The kit includes velcro ties to keep your cables tidy, so once you're happy with the driving position, run your cables and hook everything up. Job done, you're ready to race. NB. If using Fanatec or Microsoft pedals you would need to drill holes to bolt or tie the pedals to the stand base plate once you have them adjusted. So they stay on the base plate when in the stored position. I found the stand to be absolutely solid in operation, there was no shaking or wobble from force feedback or from my wheel handling. The open frame design of the stand makes it easy to heel and toe as there is no centre pole to get in the way. There are rubber pads under the base to keep the stand from moving and it stayed in place while I was using it. After use you can fold the stand for storage in seconds. Just unplug it, loosen the wheel stand lock knobs, lift the front of the pedal plate and the stand will fold to its storage position. Getting it ready for use is just as easy. The only things I could suggest that might improve the stand were minor. - It would be good to be able to set the pedal base plate to any angle 0-15 degrees. To suit different setups. - Include clamping plates to lock down Fanatec clubsport pedals on the pedal base plate when the stand is folded for storage. - There were a couple of rough edges on the pedal base plate that could have been smoothed off. - Its adaptable, being pre-drilled for Fanatec, Logitech and Thrustmaster wheels. - Adjustment for wheel height and pedal position is quick and easy. - There is no centre pole to get in the way, so it works well with 2 or 3 pedal systems. - Its rock solid in operation. The stand didn’t wobble, shake or move around while being used. - It only takes seconds to fold and pack up for storage with wheel and pedals attached. It will stand by itself when folded for storage. 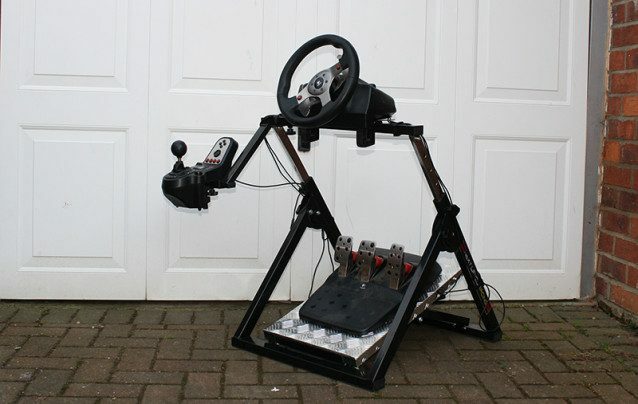 While I haven’t used any other commercial wheel stands for comparison, I think the Next Level Racing wheel stand would be a good option for anyone using a racing wheel in the absence of a full race simulator. This bargain-priced cockpit is readily available from Pagnian Imports, who supplied a review sample to games.on.net just in time for our F1 2010 review. With Gran Turismo 5 just around the corner, demand for the GTxtreme is set to soar, and I've been putting it through its paces over the last week to see if it's a comfy home for racing bums around the nation. At $649 including free delivery, the GTxtreme is relatively cheap as far as cockpits of this quality level go. You can build a cheaper cockpit yourself if you happen to have a welding torch lying around, but most geeks' metalworking abilities are second only to their useless sporting skills. For the price you get a full Bucket Seat on adjustable rails, attached to a steering wheel and pedal mount. There's no monitor stand included (that'll set you back an extra $99), but there is a gear shifter mount, which can be placed on either the left or right hand side. It's compatible with all Fanatec Wheels, as well as the Logitech G25/27 wheels. Construction is quite simple, with just a handful of pieces. A hex key and spanner is included, so you don't even need your own toolkit. Everything arrives in thick plastic padding, ensuring it's in perfect condition when it lands at your doorstep. Fearing an Ikea flashback, total construction was much easier than anticipated, taking just twenty five minutes from cardboard box to firing up my iRacing Pontiac Solstice. All of the parts that arrive in the boxWhile the instructions are easy to understand, they don't mention that the steering wheel mount must be held high while it's being screwed in. As a result, after my first build, the steering wheel was resting on my knees; very uncomfortable. However, after a quick chat to Pagnian, I discovered that holding the mount upright while screwing it in gives much more leg room. If that's still not enough, you can simply bend the steering wheel mount even more, giving giant sized people a bit more space. The seat also slides back and forth to accommodate hobbits like myself. The steering mount is pre-drilled for Fanatec wheels, but Logitech owners will have to use their standard desk clamp, or bust out the power drill to create a couple of new holes. The pedal mount also lacks any holes; I used $2 double sided tape to stop my ClubSport Pedals from lifting during heavy braking, but it'd be nice to have holes in the board so that cable ties or screws could be used. Once everything was screwed together, I mounted a Buttkicker under the seat - there's a short horizontal pole underneath that is perfect for the job. It was then time to do several hundred laps in iRacing and F1 2010 to see how comfortable and stable the cockpit is. Unlike the WheelStand Pro I'd been using up until the GTxtreme arrived, this cockpit barely moves a nanometre, even during the hardest of turns. Whether I'm handbrake turning through a hairpin in Dirt 2 or slamming on the brakes at the end of a Monza straight in F1 2010, this is a beautifully stable platform for your peripherals. The steering mount flexes just a tiny bit, but it's not an issue. It's also whisper quiet, with no rattling no matter how high I cranked the Buttkicker. The seat seems a little hard at first, but it soon softens up, delivering an exceptionally comfortable ride for even the longest Le Mans session. Like a real car, the seatback angle is adjustable. The seat needed some extra lubricant to slide properly on its rails - grease it up before you build the cockpit to make sure it's all working properly. The gear shifter mount is perfectly placed within reach, allowing for gearshifts in the blink of an eye. If there's one issue with the GTxtreme, it's that I would have liked a few more configuration options to help accommodate the wildly different shapes and sizes of the Human race. I reckon it'll be fine for anybody between 5' and 6'2"-ish. Any taller than that and you may find the steering mount knocking on your knees, making it hard to move your legs around. Given how popular TrackIRs are with racers, an option to mount one of these behind the steering wheel would also be fantastic, but I've yet to see a cockpit that features one of these. Given the lack of choice in Australia, it's a relief to see that the GTxtreme delivers an excellent driving experience. Easy to build, rock solid and stable while in use, and comfortable enough for 250 lap endurance races, the biggest stamp of approval I can give is the fact that I ended up buying my review sample once I'd finished testing. All you need to do now is get approval from the matron of the house, a task that is infinitely more difficult than setting up the Next Level GTxtreme. Paul Trengrove is the 2002 winner of the Australian Formula 3 National Series, runner up in the 2003 Australian Formula 4000 Championship at the age of 7. During my racing career, it was vital to learn and understand everything possible about a track before I actually arrived at the venue. As a result, I would play racing simulator games on a variety of cockpit simulators before a race meeting. Whilst it gave me some basic knowledge of the track configuration, I always felt that the experience never really gave me a true feel for what it is like to race a car; the steering always felt sloppy, the response from the throttle and brake was inaccurate, the seating position was unrealistic and it really did not give me the ‘sensation’ that I always thought a racing simulator should. Recently however, I was fortunate enough to test Pagnian Imports' Next Level Racing GTPro whilst playing GT5 Prologue on the PS3. For the first time, simulated racing actually felt REAL. The feedback and response through the GTPro and Fanatec Steering Wheel was so precise in comparison to what I had played before. The handling is accurate and the feedback through the steering wheel was very realistic. I could change car settings or drive the car in a number of different ways and everytime I could actually ‘feel’ the difference. In fact, when changing between different performance cars, I could easily feel the different characteristics of each car, creating an immersive driving experience. The seating position was very comfortable, and fully adjustable, as was the position of the pedals and the steering. With some of the best ever racing simulator games soon to be released (GT5, F1 2010), this racing cockpit simulator is a ‘must have’ it. Paul is currently the Competition & Operations Manager for the National Association of Speedway Racing, the first international Speedway Racing body to have achieved FIA delegation. Gran Turismo 5 (GT5) was THE “coming soon” release that encouraged me to head out and buy a Playstation 3. That was in December 2007. Finally, in November 2010, the title hit shelves in something of an anti-climax for fans of the franchise. I couldn’t be bothered running out to buy a copy on release day, let alone queue at midnight to pay $119.95 for it. But then I stumbled upon chatter about the Logitech G27 wheel set and knew that my time had come to not only pick up a copy of GT5 but also a good quality wheel, pedal and shifter set to go with it. I was somewhat underwhelmed with my last wheel purchase (a Logitech DriveFX for my XBox 360) but I know the old ‘pay for what you get’ adage and was prepared for a second try.Getting my hands on a Logitech G27 at the right price was an exercise in futility. Eventually, I gave up and turned to Google for inspiration. The search ended up with me landing back at Whirlpool and then onto the Pagnian Imports site. And that’s where this story hits top speed. I was BLOWN AWAY by the level of service and professionalism by Pagnian Imports’ principal, Hess. Within minutes of pressing submit, I’d received an email thanking me for my order. A few hours later, there was a personal note to confirm the order had just been loaded onto a truck and would be with me in one to two days.Sure enough, 48 hours later, a courier arrived with a massive delivery. Oh baby! Everything about the GTpro cockpit screamed quality, from the double-walled shipping carton right down to the plain-English assembly instructions. Within 45 minutes, I had the basic frame assembled and sat back to admire the quality of the components and the monster toy I was building.I’d just like to take a moment thank each retailer who tried to screw me with an overpriced Logitech G27 as they attempted to exploit GT5 fans. Without your belligerent sales approach I’d have never turned to Google and discovered the pure awesomeness of Fanatec hardware. (b) half a dozen house bricks. I won’t bore you to death with yet another review of the Fanatec hardware, but I will say this: the Clubsport pedals are THE MOST EPIC piece of gaming hardware I’ve ever owned. They scream quality from every angle and are so heavy that they generally stay in place under their own weight. Wheel: The GTpro wheel plate is pre-drilled (w00t!) for the GT3 wheel, which has threaded holes for screws. All you need to buy is four M6 screws and bolt it into place. Too easy. Pedals: As noted above, the Clubsport pedals will stay in place due to their weight and thick rubber stoppers on the base. However, I wanted to do this ‘right’ and drilled two holes in the cockpit foot plate to align with the mounting holes in the pedals. Two more M6 screws and some nuts, and the pedals weren’t going anywhere. Shifter: Some Scotch ‘Super Strong Exterior Mounting Tape’ means no drilling and no movement, even under “spirited” driving conditions. Cabling: 10 metres of Velcro cable tie wrap ensured cable runs were kept out of sight wherever possible. At this point, I couldn’t help myself and took it for a spin. Still without a copy of GT5 in my hands, I fired-up GT5 Prologue. Comfy seat position – CHECK! Shifter, pedals and wheel in right position – CHECK! 46” Samsung LCD TV dangerously close – CHECK! And away I screamed. Holy crap! The force feedback through the wheel and pedals was STRONG. So much so, that the wheel thrashed about on the strand like it was a trampoline. I headed to the Pagnian website to get some tips. I was gutted. Not only didn’t I find out what to do about the bounce, but I discovered that a new, V2 version of the GTpro was now available – with additional steering supports. Nooooooooooooooooooooooooooo! I dropped Hess a line and shared my concerns and frustrations. He was both understanding and reassuring. He explained that the additional steering supports were NOT critical and Hess urged me to get my rig fully calibrated and tested with GT5 before deciding if the additional supports were necessary. And the results? The proverbial chalk and cheese. The monster was TAMED. HUZZAH! Driving nirvana was in my loungeroom. I let Hess know how happy I was and thought that was that. As you can see, the wheel was not bouncing about and that’s without the additional supports. Indeed, I actually started wondering whether or not I’d bother fitting the V2 supports at all. 2. Added eye tracking camera mount. This was a home-made widget, using a couple of 90 degree brackets, some perforated metal strips and a handful of pop-rivets. Spraypainted it in a black enamel to match the cockpit and bolted it down with two more M6 screws/nuts. 3. Added 7-port powered USB hub. Mounted this under the front plexiglass panel. Means that I have a single USB cable going back to the console by having a number of peripherals (incl keyboard receiver, camera, wheel etc) connecting to a single point. 4. Added 4-outlet power strip. Mounted this under the foot/pedal plate to put all the mains power items in the one place. Same idea as the USB hub, really, and now I have a single mains power head for all the on-board power needs (eg LED lights, HUB, wheel etc). 5. Added RAM self-levelling cup holder. OK, this is just a little bit silly, but I had the cup holder left over from my 150cc scooter. It holds large coffee mugs (incl thermal travel mugs) and beer with ease. 6. Added the V2 support poles. Doesn’t make a huge difference to the racing experience, but certainly helps with moving the cockpit about. 7. And just on the topic of moving it about, the completed rig IS big and it IS heavy. Thankfully, there is a join section between the seat module and the steering/pedal/shifter module. The join is made using four M6 screws/nuts. To make moving/storage of the unit easier, I simply swapped-out the nuts for M6 wing-nuts. Too easy. As a general rule, I’ve always avoided racing games like the plague. But that all changed when the guys from Pagnian Imports sent us one of their Next Level Racing simulators to review. The Next Level GTxtreme V2 Racing Simulator is a $649 racing controller frame that is designed to suit Logitech and Fanatech controllers. Featuring secure steering wheel, pedal and gear shift connections, plus a quality leather seat with reclining and adjustable settings, the GTExtreme is designed to give you the sensation of sitting in a car while you play the latest racing simulator. Like some Ikea furniture for racing game fans, the seat requires some basic installation. Armed with the included Allan key and a bit of free time, putting the GTExtreme together was like a savoury entree to a delicious meal of high speed racing. It wasn’t difficult to put together by any stretch of the imagination, but did require regular glances at the instructions. Attaching a Logitech G27 racing controller package, it’s obvious to see that the GTExtreme is designed with racing gamers in mind. There are some simple and effective cable management solutions (although I did find the G27′s power cable lacking in the length department), which are nicely hidden behind the front name plate. But it’s when you actually sit down to game that you really enjoy the benefits of having a dedicated frame for enjoying racing games. Plugged into the PS3 and playing Gran Turismo 5, even a cynical gamer without a care for racing games like myself can appreciate the joy of nailing a tight corner, or slipping up the inside on the final bend to take out the race.At $649, the GTExtreme feels like a bargain. Sure it doesn’t include the racing controls, which are an essential part of the enjoyment, but it feels like something like this should be more expensive. The only downside with the whole rig is that it’s quite large – as it needs to be – and storage could be difficult. But if you spend time enjoying racing simulators and space isn’t an issue, this is a fantastic body for your wheel controls. Being an online sim racer and admin at one of Australia’s leading sim racing communities, I spend a fair amount of my spare time sitting in front of my computer administrating race events, keeping our members and guests up to date with what’s happening at our home on the internet and racing laps myself. One thing I’ve learnt about online racing is there are a number of boxes that need ticking before you can fully enjoy the experience. For starters you must have a good performing computer with high graphics capability, you must have a solid internet connection and you must also have a steering wheel and pedal set for realism but most importantly... YOU MUST have a comfortable, sturdy race sim that generates the feeling of being fully immersed as if you are sitting in the driver’s cockpit for real. That’s where Pagnian Imports comes in. The “Next Level Racing” Australian distributors recently sent their flagship model; the GTXTREME Racing Sim to TeamOz Racing for testing and the feedback from our four test drivers was nothing short of outstanding!! Once the professionally boxed sim had arrived via courier, it took about 40 minutes to assemble from start to finish and it was surprisingly very easy to put together using a single instruction page. A total of 9 pieces make up the sim and you get everything you will need to build it including nuts, bolts, washers and tools... Yep that’s right, you even get the tools!! Next Level Racing have thought of everything to make the job easier and have even included in the kit velcro cable restraints as well as the screws that secure your steering wheel and pedals to the chassis plates. Something that grabbed our attention when you first open the box is the full synthetic leather racing seat. This top of the line racing seat proved to be very comfortable offering good lumbar support with wings that wrap around the side keeping you tightly encased within the sim. Being fully adjustable, it can be slid back and forward to cater for different sized drivers as well as recline for those moments you feel like having a snooze in between races. Seriously though, this seat offers great all round support and just sitting in it makes you feel like you’re a real race car driver! As we went about building the GTXTREME one thing we noticed was the ease in which the bolt holes lined up making the job all that more enjoyable. The well finished tubular chassis slotted together one piece after another like a meccano set to produce an extremely stable yet light weight racing sim. Another great feature of the Next Level Racing sim is the fact that it caters for a number of different racing wheels. We used the Logitech G25 wheel, pedal and shifter kit and it slid right into place first go. Using the standard clamping methods for the wheel and shifter, they both secured to the mounting plates firmly however we did use the mounting screws for the pedals to give them a little more stability. A little tip that we can offer to those who are looking to buy a Next Level Racing sim... When assembling the chassis just nip all the bolts up lightly and pre-assemble it fully before tightening firmly. We learnt that the hard way!! After putting the GTXTREME through its paces with a vigorous afternoon test session it was agreed upon by all that drove it that it is unreservedly the best value for money sim on the market!!!! If asked to describe the Next Level Racing product in one word; it would have to be QUALITY... From the packaging to the professionally designed and constructed materials through to the ease in which it all goes together will ultimately save you time, money and lots of frustration. It's appearance is unobtrusive and with its smooth flowing lines and sleek design it is definitely a classy sim that would look great in any home or race room. As previously mentioned, the GTXTREME racing seat is undoubtedly one of the sims best attributes as is the adjustable gear shifter and steering wheel plate positions allowing the driver to feel totally comfortable behind the wheel. The perspex wind deflector / nose cone certainly adds style to the otherwise bare chassis but it also has functionality hiding the electrical cables that connect to the steering wheel, pedals and gear shifter. The sim itself provides a great ride height that doesn’t break your back when getting in or out and access to the cockpit is easy via the right hand side. The Next Level Racing GTXTREME is the complete package for those who want a quality racing sim without spending ridiculous amounts of money. Take Racing To The Next Level with a GTXREME racing sim available from Pagnian Imports or check out one of their many other great racing products at www.pagnianimports.com.au. Also offering FREE Shipping Australia wide, Pagnian Imports know how to sweeten the deal on an awesome new racing sim. TeamOz Racing gives the GTRXTREME Racing Sim 10/10. NEXT LEVEL RACING have been so kind as to lend us one of their rigs this past week. Well, I say fair but the experience has been so awesome that getting any work done has been nigh on impossible!! I think it is more than fair to say that the team specialise in bringing gamers across the Middle East the highest quality racing simulator cockpits, at the lowest possible price. For just over 2000AED the team at NEXT LEVEL RACING will supply you with the simulator (cockpit, the monitor stand) and send you on your way to motoring nirvana. Sadly the deal doesn't include a PS3/XBox - which would have been nice as I don't have access to one that works anymore, after my eldest thought it humorous to use mine as a toilet! We have a cheeky little plan that includes you - yes YOU - so stand by and prepare yourself for a challenge. In the mean time, if you are in the market for a racing sim machine - get on over to http://www.nextlevelracing.ae - you know you want to.